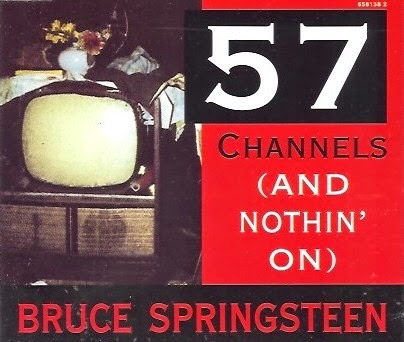 In 1992, rocker Bruce Springsteen released the single “57 Channels (And Nothin' On),” in which he vocalizes the tale of a man who tried to woo his beloved with cable and satellite television, without success. Though he was tapping into the prevalent “hundreds of channels and nothing to watch” sentiment of the time, it appears that not much has changed in a little over 20 years. At the end of March, the FCC calculated there were a total of 30,465 broadcast stations available to American citizens. The FCC’s Internet encyclopedia states that generally, cable systems offer 80 basic cable channels and 50 digital channels. In a brand new May survey, Nielsen has revealed that the average U.S. residence in 2014 receives 189 television channels, approximately a 47% increase since 2008. However, what’s remained unaltered in this five year period is that the average viewer only watches 17 channels. “This data is significant in that it substantiates the notion that more content does not necessarily equate to more channel consumption,” the measurement firm observed. Viewers are clearly interested in sticking with channels that provide content that is familiar to them, versus branching out to an unknown network. Last spring, Cablevision filed a federal lawsuit against Viacom, alleging that the latter forces their customers to “to pay for and receive little-watched channels in order to get the channels they actually want.” This report seemingly provides their case with traction, as it is now proven that many channels are not receiving a large audience share. Recently, Janko Roettgers at GigaOm hypothesized would it might look like if AMC abandoned pay-TV for the digital realm, suggesting such a scenario would not necessarily be a bad thing, further fueling the fire. Overall, the release of Nielsen’s study comes back to the central idea of a la carte television in the U.S. With five years of data backing limited usage of almost 200 channels, unbundling cable packages looks to be a fairly wise move.